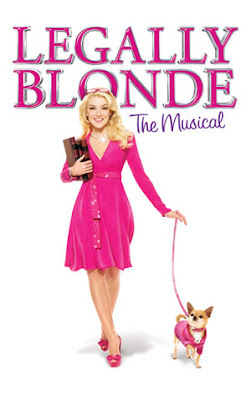 We went to see Legally Blonde last Friday night - hadn't been to a musical for quite some time! It's not the touristy kind of musical so there weren't many tourists (as far as I can tell...), but it's almost full-house that night! I probably sound stupid if I say I didn't expect it to have an all-American cast, coz the story's set in the States. The story's well-known, of course, with the two films starring Reese Witherspoon, but it's still a joy to see it as a musical. My only complaint is that Elle's world (before her transformation) is really too pink for me - it totally reminds me of the world of the drag queens in Priscilla, Queen of the Desert that I saw with my sis some months ago. The most likeable character in my opinion is Paulette, the hairdresser / manicurist who gives Elle advice but appears insecure on her own. The part I like most / find the most interesting is when the lawyers are trying to determine if a man suing their client is gay, or simply European. They keep chanting 'Gay, or just European?' and it's soooo damn funny considering there must be Europeans in the audience... I was laughing out loud and then I saw that the people sitting next to me weren't exactly as happy as I was. Oooops.